Findings say that the rings developed soon after Saturn formed about 4.5 billion years ago. A calculation of the mass of the rings based on gravitational measurements of the planet collected by Cassini indicated they formed between 100 million and 10 million years ago in roughly the final 2 per cent of Saturn’s current age. Saturn’s rings are one of our solar system’s magnificent sights, but may be a relatively recent addition, according to data obtained from NASA’s Cassini spacecraft before the robotic explorer’s 2017 death plunge into the giant gas planet. Scientists said on Thursday a calculation of the mass of the rings based on gravitational measurements of the planet collected by Cassini indicated they formed between 100 million and 10 million years ago in roughly the final 2 per cent of Saturn’s current age. On Earth, 100 million years ago was during the dinosaur age. The findings challenge the notion favored by some astronomers that the rings developed soon after Saturn formed about 4.5 billion years ago along with the other planets including Earth. Others felt the rings were much younger, but lacked crucial data like their mass to estimate their age reliably. “I like the rings and their fascinating dynamics, whether they are young or old,” said Sapienza University of Rome aerospace engineering professor Luciano Iess, lead author of the study published in the journal Science. Saturn is the sixth planet from the sun and the solar system’s second-largest, after Jupiter. All of the four gas planets possess rings, though Saturn’s are the biggest and most spectacular, with a diameter of about 175,000 miles (282,000 km). The numerous thin rings are 99 per cent ice and 1 per cent silicate particles from interplanetary debris. Their mass turned out to be 45 per cent lower than previous estimates based on 1980s data from NASA’s Voyager spacecraft. Lower mass indicates a younger age, the researchers said, adding that the still-bright rings would have been darkened by debris over a longer period. Scientists suspect the rings formed perhaps when a large icy comet or moon ventured too close to Saturn and was shattered by gravitational forces or moons collided in orbit. Saturn has 62 known moons. There may not be a more precise answer about the origin and age of Saturn’s rings “until we can get samples of ring material in our labs to examine, and possibly date via radioactive decay,” said Cornell University astronomy professor and study co-author Phil Nicholson. 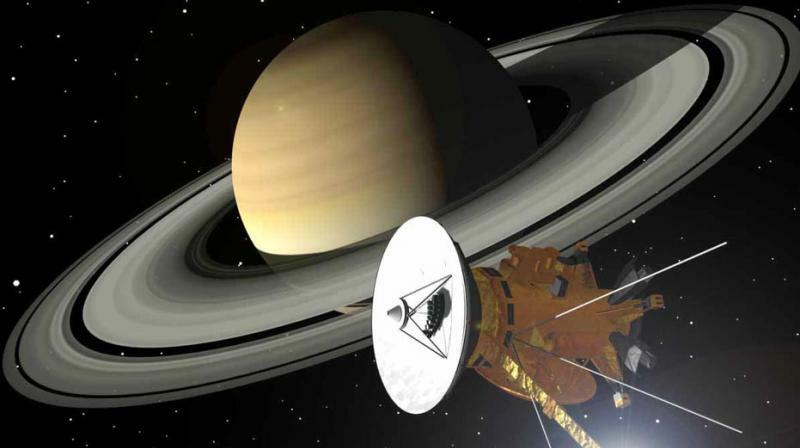 Data from Cassini’s final orbits, diving between the planet and the rings as fuel ran low, also provided insight into Saturn’s internal structure, including a core estimated at 15 to 18 times Earth’s mass. It also indicated that Saturn’s atmospheric layers start rotating in sync deeper into the planet compared to Jupiter.